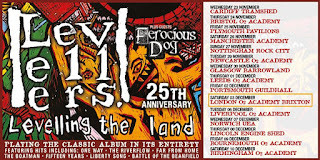 We're big fans of Brighton folk punk band Levellers and were excited to hear they will play their classic album in full plus other hits on a mammoth UK tour to celebrate the 25th anniversary of the release of their second full-length, and now classic, album. Their platinum-selling 1991 album Levelling The Land features the hit singles One Way, 15 Years and Far From Home plus The Game, Liberty Song, Sell Out, Another Man’s Cause, Riverflow, Boatman and the incendiary Battle Of The Beanfield. Their support on the tour will be the unsigned band Ferocious Dog, whose own style of folk rock music is described as "taking the traditional instruments; fiddles, whistles, mandolins and mixing them up with a bit of, raw, buzz saw rock n' roll attitude,"
The tour starts in Cardiff on November 23rd and finishes up in Birmingham on 10th December. Tickets for Levellers ‘Levelling The Land’ 25th Anniversary tour go on sale this Friday 22nd April at 9am but their Facebook and Twitter followers can get tickets 48hrs before that (so tomorrow, then) through the fan pre-sale ticket link.